This group from Birmingham contributed their incredible vocal harmonies to some of the most melodic and enduring pop songs to be released during the 1960s and early 1970s while also showcasing the talents of the hit songwriting team of Greenaway and Cook. Originally called The Clifftones, they were formed in Birmingham as a vocal/harmony trio by founding members Rod Allen (born 31 March 1944, Leicester), Glen Dale (born 24 April 1943, Kent) and Barry Pritchard (born 3 April 1944, Birmingham). In 1963, they switched to electric guitars and were joined by drummer Andy Brown (born July 7, 1946 and previously with a local band called The Lawmen) along with keyboard player David Carr (born 4 August 1943, Essex). The band became “The Merry Men” as backing group to London vocalist Robbie Hood (real name Mike West) who was managed by music promoter Reg Calvert. This arrangement did not last too long as Rod, Glen and Barry were already proficient vocalists in their own right. Also, the Robbie Hood gig involved wearing theatrical Merry Men outfits on stage including green tights which were likely an embarrassment to most of the line-up! Re-named The Fortunes Rhythm Group, they managed to come first place at a beat contest held at Edgbaston’s Gay Tower Ballroom (at the time there was at least one other band active in the Midlands area called The Fortunes). The group projected a clean, well dressed image on stage and encouraged by manager Reg Calvert, included covers of Dionne Warwick, Gene Pitney and Broadway show songs into their repertoire. The Fortunes were signed to the prestigious Decca Records label in 1963 and their first record release – under supervision of future Who and Kinks producer Shel Talmy – was a bizzare cover of the Jamies 1958 U.S. hit Summertime, Summertime (also attributed to “The Clifftones”). A second Fortunes single released the following year Caroline was adopted by the pirate radio station Caroline as its theme tune. Despite plenty of airplay, the song did not chart and subsequent single releases, although highly competent, were derivative of the current “Mersey Sound”. Compositions by group members in those days were usually confined to single b-sides such as Barry Pritchard’s Come On Girl which appeared on the back of their third single I Like The Look Of You released in 1964. 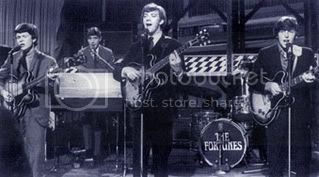 The Fortunes fifth single was a ballad written by professional songwriters Roger Greenaway & Roger Cook and the recording featured lavish instrumentation as well as the now trademark 3-part harmonies by the group featuring Rod Allen’s lead. The song You’ve Got Your Troubles, suited the band’s image perfectly with the record almost reaching the top spot in the British charts in August of 1965 and also climbing to No. 7 in the U.S. charts. With a hit formula now established, a follow-up Here It Comes Again (also composed by Greenaway and Cook) was released soon after and gained a No. 4 chart placing. With this success, The Fortunes were able to undertake a package tour of the U.S.A. along with Peter & Gordon and fellow Brum group The Moody Blues who were at that time enjoying the international success of their hit single Go Now. The Fortunes next few singles missed the charts and in July 1966, guitarist/vocalist Glen Dale left the group to go solo. He was replaced by Scotsman Shel MacRae but with the onset of the psychedelic era, the Fortunes’ record sales continued to decline although plenty of bookings were available for the band on the lucrative cabaret circuit. In August of 1967, the Fortunes switched to the United Artists record label and released new singles consisting of self-composed material. The first of these was the excellent track The Idol by Rod Allen and Barry Pritchard. This change of direction, although promising, did not achieve chart results but the group soon found new success in recording “advertising jingles”, most notably It’s The Real Thing for Coca-Cola. This, along with regular bookings on the northern club circuit, sustained the band throughout the later 1960s. Another interesting record release by the Fortunes during this period, was Fire Brigade, a song written by Roy Wood of The Move who were also from Birmingham. Although the single was a major hit in Britain for the Move in 1968, the Fortune’s version, which also may have had backing vocals by Roy Wood, was only released in the U.S.A. where it made little impact on the record charts. David Carr left the group in August 1968 and by 1970 it seemed that The Fortunes career as a recording act was behind them. However, a switch to the Capitol Records label in 1971, saw the group hooked up once again to writers/producers Greenaway and Cook and the result of this partnership was a new single Here Comes That Rainy Day Feeling Again which gained the Fortunes a No. 15 chart placing in the USA. The comeback was complete when the next single Freedom Come Freedom Go made No. 6 in the British charts followed by Storm In A Teacup a year later also making it into the top ten. Despite further personnel changes over the next several years, The Fortunes continued as a major attraction on the club circuit and in 1960s nostalgia shows. Founding member Barry Pritchard left the group in 1995 due to ill health and became a resort operator in Spain. He died in January 1999 at 54 years of age. Remaining original member Rod Allen continued to tour and record with the present line-up of the Fortunes which also includes former Badfinger keyboard player Bob Jackson as well as veteran performers Paul Hooper (drums) and Michael Smitham (guitar). Unfortunately, Rod Allen passed away suddenly from cancer in January of 2008 leaving the group’s future at this time uncertain. I was a big fan of the Fortunes back in the 60’s. Then, 20 odd years later I made the acquaintance of Barry Pritchard through our mutual involvement in local junior football. I didn’t even realise his connection with the Fortunes until he told me. We got to be very good friends and we very nearly ended up setting up a joint operation in Spain when he had to find a new way to earn a living after ill health prevented him from continuing with the Fortunes. It was very sad that things between Barry and Rod were so acrimonious at this time. I don’t think Barry ever got over it before his tragic death a few short years later. Barry was a wonderful guy. He was such a kind and generous man and he had a heart of gold. He went at everything 100 miles an hour and was totally committed to everything he got involved in. Dear sir , I was recently in torquay and an artist on in the hotel by the name of Kieth Brown, said he was in the fortunes , having only found the name brown , Andy Brown was kieth at anytime in the group . Was Kieth Brown ever a member of the the Fortunes, as this singer said he had been. Hi, just seen Keith at Sefton hotel in babbacombe, good show. No evidence I’ve seen to suggest he was in fortunes, although it was suggested that was the case. Saw a fella in a bar in Paphos,Cyprus 2008,who said he sang with the fortunes,he even sang You’ve got your Troubles,which was sung well. I had a CD from him but for the life of me cannot remember his name.